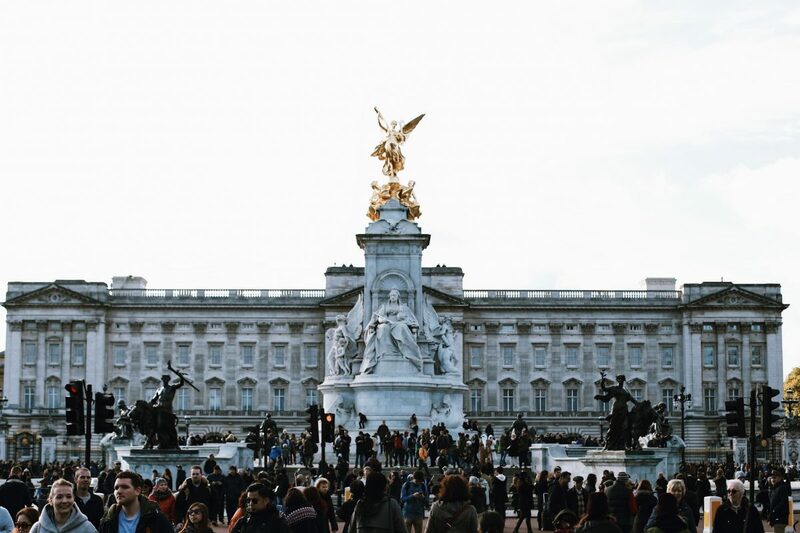 London is full of historic attractions, but none are more popular than its royal palaces. They offer a tantalizing glimpse into the political and private lives of some of the richest and most famous people in the world. London’s palaces are truly unique, with unforgettable interiors and impressive landscaped gardens. The royal residences discussed below are open to the public, and two of them are in the city center. Buckingham Palace – Buckingham Palace is the official residence of Queen Elizabeth II and possibly the most famous building in London, if not England. The palace was originally the residence of the Duke of Buckingham until King George III acquired it for his wife, Charlotte. George IV upgraded the building substantially, finally deciding to convert it into a palace in 1826. He employed John Nash, a highly-esteemed Regency Era architect, to help him extend the building. Queen Victoria was the first sovereign to live in Buckingham Palace. Behind the scenes, Buckingham Palace functions as a mini town. It has its own chapel, a cinema, post office and a doctor’s office that’s equipped to perform surgeries. The Queen has a private art collection in the basement and her 39-acre garden has 25 different varieties of roses, including one dedicated to Prince William. The Changing the Guard at Buckingham Palace is a popular spectacle of British pageantry that takes place daily throughout summer and is free for all to see.Today, 19 State Rooms are open to the public in summer and early autumn, including the magnificent ballroom and a Picture Gallery with 450 pieces of art (not including the private collection). These rooms are still used by the Royal Family to receive and entertain guests on State and ceremonial occasions. The Queen has received a diverse collection of gifts over the years, including a Nigerian beaded throne, drawings by Salvador Dali and an embroidered silk scarf from Nelson Mandela, which are on display with many others. Kensington Palace – Kensington Palace was most famously home to Princess Diana and became a site of pilgrimage after her death in 1997. It is currently the royal residence of her son Prince William and his family at the recently renovated Apartment 1A. Despite the apartments being in use, the majority of the palace has been open to the public since 1899. The palace is ideally located in Kensington Gardens, which adjoins Central London’s most iconic open space, Hyde Park. Kensington Palace was originally known as Nottingham House, a Jacobean-era mansion built in 1605. It was purchased by joint rulers King William III and Queen Mary II, who commissioned Christopher Wren to expand and update it. After its heyday in the 17th century, it was neglected and eventually separated into smaller apartments for minor royals. It was also the birthplace and childhood home of Queen Victoria, one of the longest reigning British monarchs. Her parents, the Duke and Duchess of Kent, were royal but not wealthy and knew she would probably inherit the throne. Visitors will find that the focus is on Queen Victoria because she spent her formative years here. They can also tour the state rooms and see the fine tapestries, ornaments, and artifacts of the Georgian era. After that, they can enjoy a stroll in the immaculately landscaped gardens and enjoy refreshing traditional afternoon tea in the grounds. Hampton Court Palace – As the stage for some of the most tumultuous time in the Tudor period, Hampton Court Palace is where several of Henry VIII’s private and public dramas were played out. Henry was famous for his love of the outdoors and entertainment as much as for his six wives. He introduced tennis courts, pleasure gardens, a bowling alley and a vast hunting park of more than 1,100 acres to the original palace. Hampton Court is in the Borough of Richmond, around 15 miles from the center of London. However, it is easy to reach by train and presents a great day out for all the family. Discover atmospheric corridors, including the Haunted Gallery, where restless ghosts reportedly wander. The huge palace grounds are equally impressive, with a world famous maze and spectacular views. Experience a second royal residence, the Baroque Palace, within Hampton Court’s grounds. This masterpiece was built by Sir Christopher Wren for William III and Mary II. Its ornamental gardens were a hotbed of courtly gossip and provide a fascinating showcase for Stuart and Georgian privilege. The Cumberland Art Gallery houses pieces from the magnificent Royal Collection, which span 500 years and include works by famous artists such as Holbein and Rembrandt. During the summer, a host of events take place, from plays performed around the palace to Tudor jousting and a food festival. Palace of Westminster (Parliament) – The Palace of Westminster is the meeting place of the House of Commons and the House of Lords, the two houses of the Parliament of the United Kingdom. The Palace is located on the north bank of the River Thames in the City of Westminster, in central London. It is commonly known as the Houses of Parliament after its occupants. Originally it was known as The Old Palace, a medieval building complex that was destroyed by fire in 1834. It’s replacement, the New Palace, is what stands today. The palace is owned by the monarch in right of the Crown and for ceremonial purposes, retains its original status as a royal residence.